I'm taking a short detour from testing stuff to have a closer look at some numbers. One thing I have noticed looking at the expected goal stats over the last few/several months is that, whilst it holds very true at the team level, it can get in a mess pretty quick-style with player data. 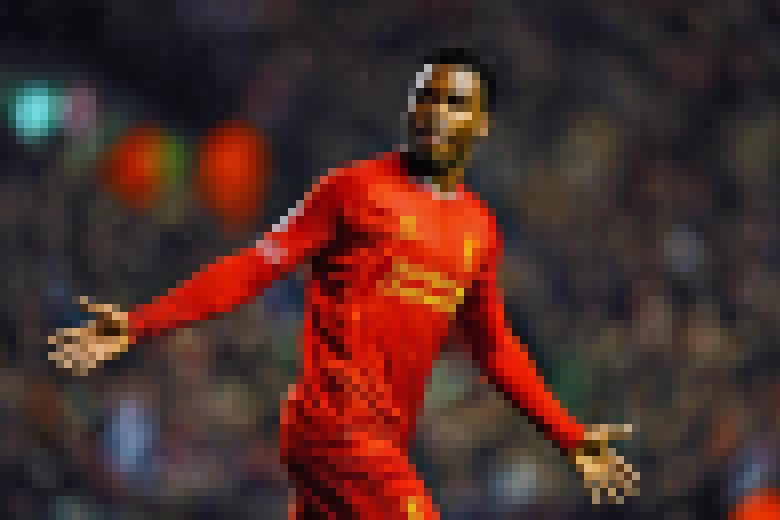 This is particularly true when a player like Daniel Sturridge comes along so I've decided to take a closer look at his numbers to see what's going on. In this post I'm going to run through a bunch of different 'metrics' from good ol' goals per game to some more advanced stuff like shot placement. The stats are taken from the last two and half seasons, from beginning of 2011/12 to when he was at Chelsea to the Southampton v Liverpool game a week or so ago..
Sturridge was at Liverpool from game 30. Each point represents the goals scored over the previous 5 games, a rolling average. This is the type of stat you would have seen on this blog 10 years ago if it existed. The narrative would be that Sturridge wasn't much kop at Chelsea but must have found Ian Rush's boots in his locker at Anfield. I wish I had some data from 2010/11 when he scored 8 goals in 12 games for Bolton (0.66 goals/game). This chart doesn't include these games at all so he did do alright for himself at the start of 11/12 for Chelsea. Goals per game is quickly dispensed with. I have 230 shots for Sturridge in my dB so first step was to normalise Sturridge's goals on a per shot basis. Each point is goals scored from the last 20 shots. 20 shots approximates roughly with 5-6 games for Sturridge. Similar Narrative though. Bright start. Big slump, sort of recovered, Joined Liverpool. Slumped a bit again. Boom. Rushy's boots. Everyone knows by now that not all shots are equal so the chart above is the average expected goals per shot based on the location of the shot, whether it was a header or not, and type of pass (cross, through ball, etc). Again this is a rolling average over 20 shots. The narrative? It's up and down but gradually up. At Chelsea his average chance was worth 0.10 goals. At Liverpool it's 0.13. This doesn't sound much but it's 30% more, thus we'd expect Sturridge to score 30% more goals per shot at Liverpool based only on the quality of chances he's getting. Chance Quality does not do a great job at all of explaining Sturridge's increased goals per shot ratio in his time at Liverpool though, and this should highlight my current struggle with expected goals as a metric for players I mentioned in the opening paragraph. It does not track well with his goalscoring chart (Goals per Shot). According to his Chance Quality, at Liverpool he should have been good for around 15 goals. He's actually scored 26. This then leaves the big question. Is it skill? Is it luck? Is it Liverpool? Is the model not good enough? All of the above I expect but statistically we are on very thin ice. This chart is analogous to the 'Goals per Shot' chart except now we are adjusting for the Chance Quality of each shot. I've marked out the 'average' line at 1.0. This is the first time we get some extra information from the more advanced stats in my opinion. We can easily see how Sturridge varies above and below this average which we couldn't do satisfactorily with Goals/Shots as we did not know if the shots were "easier" or "harder" than an average shot. The top chart here shows Sturridge's Shot Accuracy, that is shots on target divided by shots. It's pretty interesting in that he's remarkably consistent. Even during his "low accuracy" days midway through his Chelsea spell, he's still consistent, ish. It's interesting too that his low accuracy period at Chelsea is tentatively aligned with his worst goal scoring spell, although let's be honest it doesn't explain the highs and lows well at all. The second chart is an adjusted shot accuracy measure weighed by expected accuracy for shots based on location, type, pass, in the exact same way Expected Goals is done, except for accuracy. It generally does not differ from and is highly correlated with standard Shot Accuracy. It does have to be said though that Sturridge's two goal scoring peaks (from Goal Conversion chart) do align with his two best spells of Expected Accuracy. Could this be important? . We can also see Sturridge does a great job of finding the target. Generally 1.5 - 2 times above average at best, and only average at worst. This is the final chart, I promise. The thicker blue line shows the percentage of Sturridge's shots that were in one of the 4 corners of the goal. The feint line is his regular shot accuracy as shown above. You can see toward the end of the chart the two lines almost converge which means almost all of Sturridge's shots are toward the corner of the goal rather than hit centrally. A good thing, right? Generally speaking, a shot to one of the corners is almost twice as likely (37%) to result in a goal than a shot hit centrally.(20%). A shot is also more likely to be hit in the corner (20%) than centrally (11%). If you split the goal into three sections however it's an even split and could well be appear random. Sturridge's shot placement of late very impressive, consistently finding the corner with ~45% of his shots. He's displayed this characteristic over a good few periods in this data too. Is assuming the 'keeper is placed centrally and that hitting the corner a "good thing" a viable one? This doesn't prove or disprove anything, but I feel probing the data this way is essential to get under the skin of it. My expected goal model is based on a huge number and variety of shots from different players and teams and I think currently it best models the system as a whole, that being football teams, which themselves comprise all the same vagaries and nuances that go into the model. Perhaps a player should be consider a sub-system and not be rated or assessed upon an expectation derived from the whole system (team). It's becoming evident from expected goal models that >>90% of a team's goals can be attributed to the combined quality and quantity of chances the team creates, but in my experience the same cannot be said of the all-important leading goalscorers in the league. When a player is way above the average what does this mean? That'll he''s been lucky, that he's amazing? That he'll be signed by Real Madrid in the summer? Every season in every league there's a handful of top goalscorers whom I'll bet all out-perform the model. I am hopeful looking at a profile of shooting stats like this this will make a better subject to evaluate so my next step will be taking a similarly close look at the same data for a number of other players. Van Persie, Suarez, Benteke, Michu, Ramsey, Jelavic and Papiss Cisse spring to mind as good candidates. Testing of Football Stats: Part 2 - "Predictive"